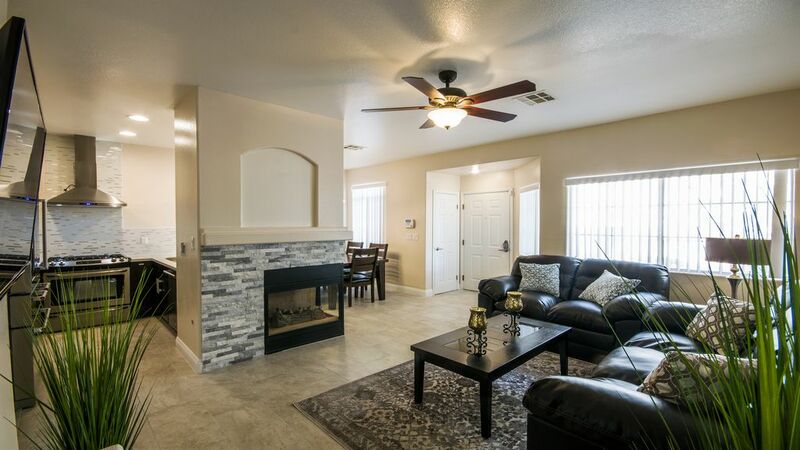 Bienvenido al maravilloso Towmhome Tivoli, una lujosa casa adosada de 3 habitaciones ubicada en el tranquilo vecindario de Summerlin. Townhome Tivoli tiene para ofrecer 3 amplias habitaciones junto con 2. 5 baños. • Disfrute de la privacidad de 3 habitaciones con HDTV inteligente de 50 "
• Comedor con mesa de comedor marrón de madera entera y 6 sillas. • Dormitorio Galleon amueblado con 2 camas tamaño queen de color marrón, el lujoso confort del lujoso colchón y un HDTV inteligente de 50 "
• Dormitorio de Emerfield amueblado con un juego de dormitorio de tamaño queen marrón rústico, lujoso confort del lujoso colchón y un HDTV inteligente de 50 "
• Dormitorio de Chanella con un juego de dormitorio marrón de tamaño queen, la lujosa comodidad del lujoso colchón y un HDTV inteligente de 50 "
A good location for our rock climbing vacation. The place was very comfortable and clean. Igor was great to deal with. The description was true to it's word. This home was very nice, clean and updated. It had everything you needed even spices for cooking. I also loved parking in the garage and having a garage door opener. Beds were very comfy. The only downside was that you could hear neighbors easily but that is of no fault to this owner. Overall it was a great stay and close enough to the strip and other areas for dinner and shopping. We loved our stay at this townhouse! It was very clean and had everything we needed except for our food! Everything is updated and the beds were the most comfortable of any we’ve slept in!! The proximity to stores and casinos is just a short drive. Igor was very responsive to any questions we had. We will definitely stay here again if in Las Vegas. My husband & I spent a month at this townhouse and we very much enjoyed our stay. There is a nice park with trails across the street of this complex where we walked each morning. The fireplace was so nice to have on chilly evenings in January. The owner, Igor, was great. We had a minor issue and he took care of it immediately. He also contacted us at a later time to see how we were doing and said to let him know if we needed anything. The appliances are all fairly new and very nice. The bedrooms are all a good size & it was also nice to have a laundry room with the washer & dryer. We very much recommend renting this townhouse.